The Facebook pages of New Jersey celebrities, including the "Jersey Shore" MTV show cast, are littered with requests for them to assist in Hurricane Sandy relief. Superstorm Sandy pummeled much of the northeast, but New Jersey was particularly devastated. Now, some of the storm's victims are using Facebook to call publicly on local celebrities for help rebuilding the state. Music superstars Bruce Springsteen and Jon Bon Jovi were two of the most popular targets, while the infamous "Jersey Shore" MTV show cast received a barrage of more unkind comments. 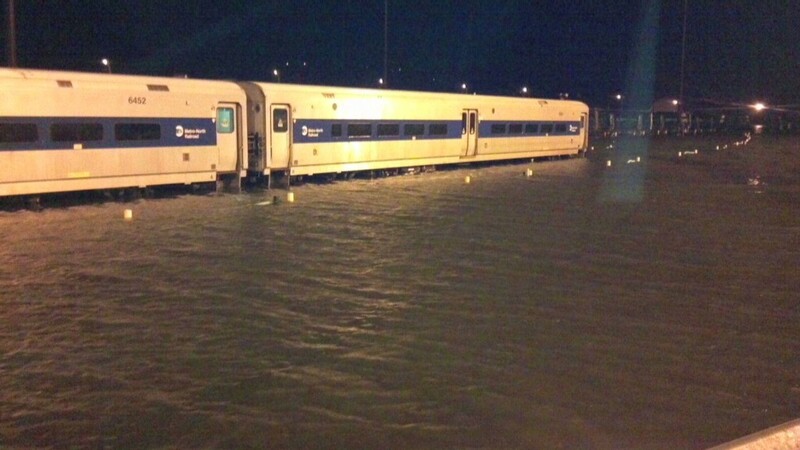 Before Sandy even made landfall on the New Jersey coast on Monday, the damage to the state was apparent. The storm took out entire boardwalks, shorelines and oceanfront properties along the Jersey Shore. By Tuesday, hundreds of fans posted to the Facebook (FB) pages of Bon Jovi and Springsteen, pleading for what they quickly dubbed a "Restore the Shore" benefit concert. "This is a call to action to those Jersey Boys we love and call our own -- Jon and Bruce! Please help with a benefit concert or other event for disaster relief for your Jersey brothers and sisters," one commenter posted to Bon Jovi's fan page on Wednesday. Others created entire Facebook community pages devoted to pushing for a benefit show. Those fans got their wish on Thursday morning, when the Associated Press reported that both Springsteen and Bon Jovi will play a Sandy relief concert in New York City on Friday. NBC will air the telecast at 8 p.m. on its networks, and the show will benefit the American Red Cross. Other performers include Billy Joel (from hard-hit Long Island), Christina Aguilera, Sting and Jimmy Fallon. Commenters cheered the move, thanking both artists. The cast of the "Jersey Shore" received quite a different outpouring on their fan pages. The show's Facebook page, run by Viacom-owned (VIA) MTV, posted about the storm on Tuesday saying the cast "sends their thoughts and prayers out to everyone affected." But only about half of the cast members acknowledged Sandy on their own pages, and two others instead posted news touting their product lines. Many commenters showed vestiges of Jerseyans' longstanding frustration the scandalous MTV show. "Hope you and your cast mates and MTV are planning on opening your wallets to the boardwalk that made you rich and famous. Seaside has been destroyed," one user wrote, referring to the shore town that housed the reality-show stars. The post had received 100,000 Facebook "likes" and 3,000 comments as of Thursday morning. Cast members Nicole "Snooki," Jenni "J-Woww" and Mike "The Situation" scored points with some fans for their Sandy-related Facebook posts, but Sammi "Sweetheart" and Pauly D drew ire for tin-eared product announcements during the storm. Sammi posted late Monday about the launch of her men's cologne, and Pauly D updated his page about his branded headphones on Tuesday, when the storm damage was particularly fresh and painful. "Shame on you for this post -- promoting your useless product during such devastation at the jersey shore," one user commented on Pauly D's post. Others defended the Jersey Shore stars, particularly Snooki, who posted instructions on her page for donating to the Red Cross. "None of you know what she has planned to help Seaside and I'm sure none of you are getting off your asses to help either," one commenter wrote in a profanity-laden post. "You guys seem to have forgetten [sic] that she was affected by Sandy as well and has her son and fiance to worry about." Asked about its "Jersey Shore" relief plans, MTV released a written statement to CNNMoney: "Our thoughts and prayers go out to all of those affected by the hurricane, especially our friends and business owners in Seaside Heights, NJ who are now part of the MTV family. MTV is actively exploring ways to best help with the recovery efforts, and in the meantime we are encouraging everyone to donate to the American Red Cross' disaster relief efforts." As of Wednesday morning, the American Red Cross had received an estimated $11.4 million in donations to Sandy relief efforts.